The two greatest missionary heroes of the age of the apostles were Peter and Paul. Both had an enormous impact on the early church, gathering believers and planting congregations. They both left behind profound writings that anchor the doctrinal portion of the New Testament. And yet both had much in their pasts to be ashamed of. Peter denied knowing or believing in Jesus on the dreadful night of Jesus’ arrest and trials. For the rest of his life, the crowing of a rooster at dawn must have given him bad flashbacks. Paul spent his earliest adult years violently persecuting Christians, and the mental images of his cruelties were never far away. Only God’s grace made him somebody and kept him going. Those painful memories kept both apostles humble and kept their words soft when they sought to restore others whose lives were unraveling: “Brothers, if someone is caught in a sin, you who are spiritual should restore him gently” (Galatians 6:1). Shaming and shunning only push people farther away from their Savior. Be kind to sinful fools. You were one once, and a time may come when you are one again. Grow Closer With God During Lent! 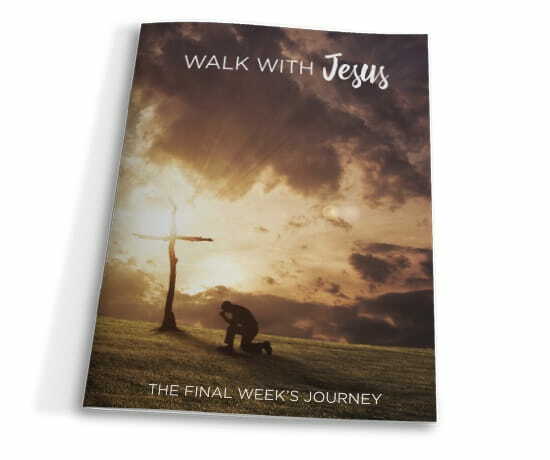 Specially written to guide you during the Lenten season, Walk With Jesus: The Final Week’s Journey will give you a better understanding of what Jesus experienced during the last week of his life—and help you grow closer with God in the weeks leading up to Easter. Request your copy of Walk With Jesus when you donate to help share the timeless truths of God’s Word with more people!